Summary: Nyasha Sengayi works throughout Zimbabwe to advocate for the rights of women and girls. Despite continual threats to her life, she travels to remote areas and educates citizens about abuse and the remedies for abuse. She has spearheaded many campaigns to arrest, convict, and punish abusers, and she has offered support to the victims as well. Sengayi coordinates One Billion Rising, a global organization that focuses on justice for victims of violence, and she started her own organization, Source International Zimbabwe. 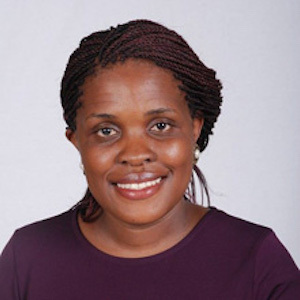 The speaker is Nyasha Sengayi, the founding Director of Source International Zimbabwe, which advocates for women’s rights throughout the country. Sengayi is also Zimbabwe’s coordinator for One Billion Rising, a worldwide organization that focuses on justice for victims of violence. Sengayi has worked for several years in both organizations, and before that did everything she could as an individual to protect women. Sengayi has made a difference. Child marriages are now outlawed in Zimbabwe. Women are much more aware of their rights and of the means to secure justice for those rights. Sengayi travels throughout the country—even to its most remote districts—to educate citizens, to rescue young women trapped as prostitutes, and to seek prosecution of men who abuse women. She participates in countless campaigns to further her advocacy—this despite the very real threats to her life.